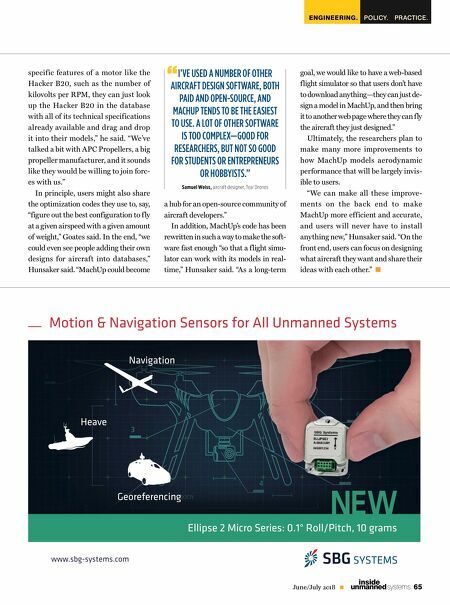 65 June/July 2018 unmanned systems inside ENGINEERING. PRACTICE. POLICY. specific features of a motor like the Hacker B20, such as the number of kilovolts per RPM, they can just look up the Hacker B20 in the database with all of its technical specifications already available and drag and drop it into their models," he said. "We've talked a bit with APC Propellers, a big propeller manufacturer, and it sounds like they would be willing to join forc- es with us." 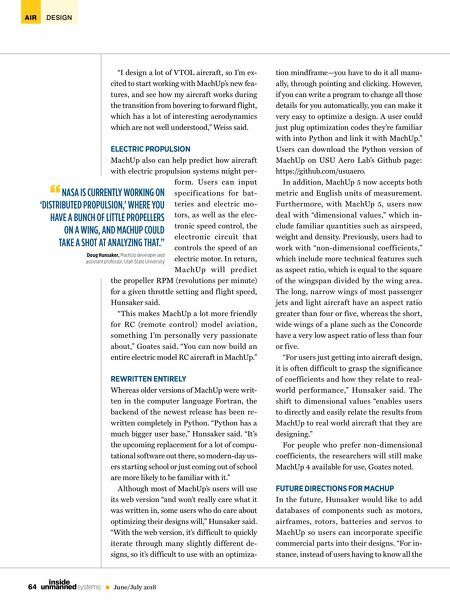 In principle, users might also share the optimization codes they use to, say, "figure out the best configuration to fly at a given airspeed with a given amount of weight," Goates said. In the end, "we could even see people adding their own designs for aircraft into databases," Hunsaker said. "MachUp could become a hub for an open-source community of aircraft developers." In addition, MachUp's code has been rewritten in such a way to make the soft- ware fast enough "so that a flight simu- lator can work with its models in real- time," Hunsaker said. "As a long-term I'VE USED A NUMBER OF OTHER AIRCRAFT DESIGN SOFTWARE, BOTH PAID AND OPEN-SOURCE, AND MACHUP TENDS TO BE THE EASIEST TO USE. A LOT OF OTHER SOFTWARE IS TOO COMPLEX—GOOD FOR RESEARCHERS, BUT NOT SO GOOD FOR STUDENTS OR ENTREPRENEURS OR HOBBYISTS." Samuel Weiss, aircraft designer, Teal Drones " goal, we would like to have a web-based flight simulator so that users don't have to download anything—they can just de- sign a model in MachUp, and then bring it to another web page where they can fly the aircraft they just designed." Ultimately, the researchers plan to make many more improvements to how MachUp models aerodynamic performance that will be largely invis- ible to users. "We can make all these improve- ments on the back end to make MachUp more efficient and accurate, and users will never have to install anything new," Hunsaker said. "On the front end, users can focus on designing what aircraft they want and share their ideas with each other."